If you don't want to brine your turkey, just skip ahead to the roasting instructions, which start at Step No. 7. For more information on brining and turkey roasting, read "Talking turkey." Defrost: If your bird is still frozen, give it a couple of days in the fridge to defrost. If you don't have that much time, soak the bird in cold water (change the water regularly to keep it cold; a cooler is good for this), but keep in mind you'll still need at least a day to defrost most birds. Water: How many gallons of water will you need for brining? Well, put the turkey in your stockpot or cooler and pour water in around it, keeping track of how much water you're using. Once the bird is completely submerged, you'll know how many gallons you've got. Salt: Per the instructions in the November/December 2004 issue of Cook's Illustrated magazine, you'll need to measure out your salt depending not just on the size of your bird but on how much time you plan to spend brining. For an overnight brine (12 to 14 hours), use ½ cup table salt for every gallon of water. For a quick brine (4 to 6 hours), use twice as much table salt, or 1 cup per gallon of water. As for the kosher-salt thing, you need more of it because kosher salt is less dense than table salt, and kosher densities vary by brand. If you have Diamond Crystal kosher salt, use 2 cups of salt per gallon of water. If you have Morton Kosher salt, use 1½ cups of salt per gallon of water. Double these amounts for a quick brine. Soak: Once you've added water and salt to the bird, add a few handfuls of freshly chopped herbs, if desired. With your hands, turn the bird over a few times to make sure the herbs are distributed and the salt is dissolving. Store: A stockpot with a bird in it should fit inside the average American refrigerator. A cooler won't, so you may have to pack your cooler with bags of ice to keep the bird under 40 degrees. Should you be so fortunate as to have a back yard or deck, and the Thanksgiving weather where you live is agreeably cold (but not, say, 15 degrees out), just leave the cooler outside. Dry: When the brine time is up, carefully pour out the brining liquid (try not to splash it all over your kitchen) and then rinse off the bird under cool running water. Pat the bird dry inside and out with paper towels (or clean dishtowels that you will wash promptly). If you have the time and inclination, arrange the bird breast-side up on the V-rack in the roasting pan and cram the whole thing in your fridge, uncovered (or in a protected spot outside, if the weather is dry and cold), and let it air-dry for 8 to 24 hours. Meanwhile, bleach out your cooler, or thoroughly wash your stockpot. Butter: Preheat the oven to your favored roasting temperature — pretty much anywhere between 325 and 400 degrees. If you air-dried the bird, drain any remaining liquid out of the roasting pan. Smear several tablespoons of soft butter all over the bird, making sure to rub the butter under the skin as much as possible. If using a few handfuls of sliced aromatics, place them inside the turkey's cavity. You may also want to pour a few cups of water or stock into the roasting pan underneath the bird (making sure the bird isn't actually sitting in the liquid) to ensure a moist bird. Roast: If you have a smaller turkey, cook it breast-side down in the V-rack for the first hour or so of roasting time, then (wearing thick, clean oven mitts) flip the bird breast-side up to finish cooking. 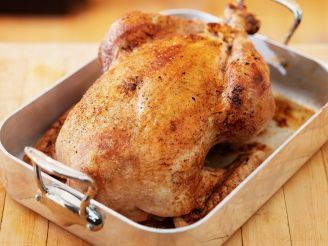 If your bird is huge and unwieldy, however, arrange it breast-side up and tent the top of the bird with aluminum foil; remove the foil after the first hour or so of cooking. If you love to baste, do so every 30 minutes, but stop basting during the last hour of cooking to ensure a crisp skin. If basting drives you crazy, skip it; the butter (and the liquid in the pan, if using) should ensure a moist bird. Time: Roasting times will vary depending on the size of the bird, but smaller birds should take about 2 hours, larger birds 3 or even 4 hours. At 325 degrees, an unstuffed turkey will need about 10 to 12 minutes for every pound of bird to cook completely. Test for doneness with an instant-read thermometer: 160 to 165 degrees in the thickest part of the breast, 170 to 175 degrees in the thickest part of the thigh. Rest: When done, remove the turkey and let it cool for 30 minutes before carving (if you don't let it cool, all the juices will gush out and you'll end up with dry, dry turkey). Use the half-hour to make gravy directly in the roasting pan on the stovetop, heat up premade gravy, finish side-dish preparation, or just enjoy a well-earned glass of wine. Carve: Heck, find somebody else to tackle the carving; you deserve a break. Or watch this video for pointers on getting the job done yourself.